The Fellowship was fortunate enough to obtain a copy of SWERVE from Arcana Comics. The story is by Jon Judy, the art by Dexter Wee, and letters by Jace Tschudi. The story follows Eric Clayton, a young man who left college early to lead a promising NFL career. Unfortunately, it was cut short by an injury and becomes the newest talent of the Southwest Wrestling Association. He realizes that there is more going on here than wrestling and becomes a part of it to raise money for his family. He sees and has done too much that he wants to get out, but finds that is a little difficult to do…and stay alive. What does he do: get enough money and going into hiding? Or does he go to the police for protection? Whatever he does, will he live to see if it was the right choice? Swerve is a wrestling term meaning a sudden change in the direction of a storyline to surprise the fans. There are a couple of swerves in this book, and they are pulled off well. This is a solid piece of crime fiction from Jon Judy. Dexter Wee’s art is very impressive and once again the colors does a great job setting the mood (underrated part of a comic I feel). In one of my earliest reviews I made a comment about crime comics not being my cup of tea. That has changed in the past year, and books like SWERVE are the reason. SWERVE is available for ordering at www.arcana.com. The individual chapters are available now on www.comiXology.com. 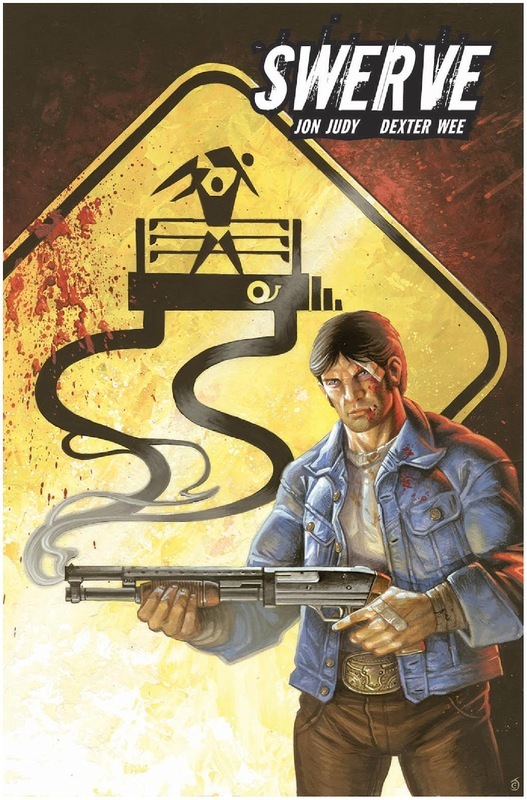 The graphic novel will hit stores February 27.